The International Biology Olympiad (IBO) is a competition organized for talented high school students who are interested in biology. The team is selected based on a national exam that any high school student can participate in. The next event is held in Iran, in 2018, and the team training began in early August, 2017. 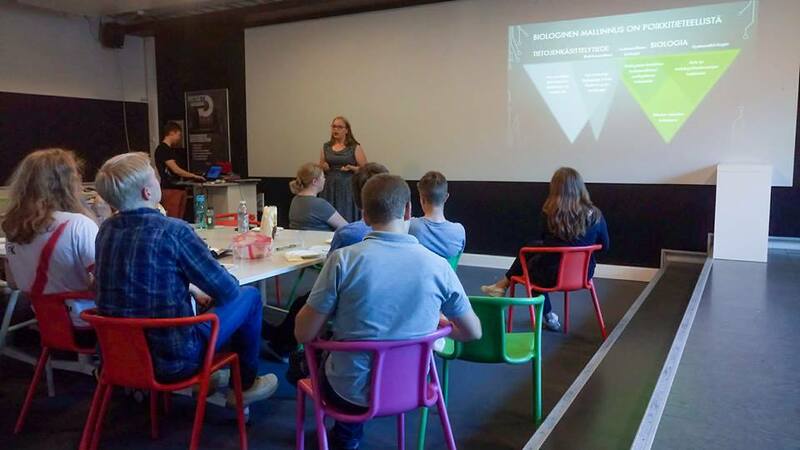 After the team had gained some laboratory experience in Aalto University laboratories, we gave them two presentations: a presentation about our project and another about Mathematical Modeling in Biology. The topics that we covered were history of computational biology, logic ports in the context of biological systems, ordinary differential equations and a case study of dynamically modeling differentiation of T cells. We hope that our presentations were interesting and useful to the team and wish them the best of luck in the Olympiad! Our presentation slides can be found from here. Our last visit before the Giant Jamboree was at the University of Turku where we organized an event 19.10.2017 with Eva-Mari Aro, Pauli Kallio and Eevi Rintamäki. We presented synthetic biology, iGEM and our own project as a lecture, where the main point was to get the students and teachers enthusiastic enough to form Turku’s own team in the future, since currently we are the only team in Finland. The event was promoted to bio students by Pauli Kallio and one of our sponsors, The Union of Professionals in Natural, Environmental and Forestry Sciences Loimu. We provided a flyer to help promoting. Since Turku city actually has two universities, there might also be a possibility that the University of Turku might form a team with Åbo Academi. Only time will tell. We discussed with a few very interested teachers and some of the students seemed also pretty intrigued by the idea, so hopefully this attempt will prove successful in the future. We shared some of the Biotech Week balloons, collaboration postcards and patches at the event and our banner was placed on a visible place outside the auditorium, so we hopefully reached a lot more people than just the listeners. In addition to organizing the event, Pauli Kallio was also kind enough to give us an inspiring tour at their laboratory and to tell us about their Cyanobacteria research. The Finnish fall was for once showing it’s best and all in all, we had an absolutely wonderful day in the beautiful city of Turku! It deserves to be mentioned that even if this was our last visit before the Giant Jamboree, we will make several visits to the different departments and faculties of the University of Helsinki and Aalto University, as well as visit one high school and at least Thermo Fisher afterwards in order to spread the word about iGEM and synthetic biology even further. 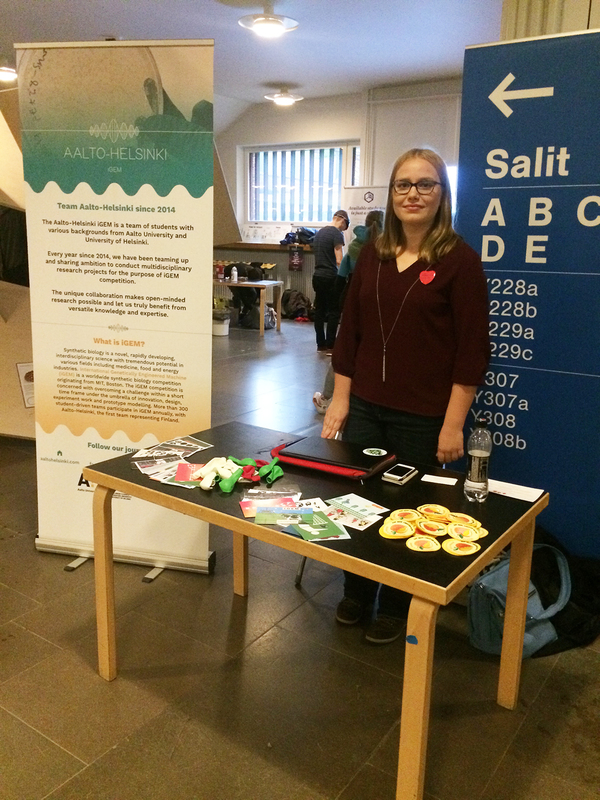 Kampuskarkelot is an event organized by AYY - Aalto University’s student union. Its target audience is the freshers and new exchange students, and it is therefore organized in the main lobby of the university’s main building. Kampuskarkelot is a chance for student associations such as choirs, theatre clubs and events to market themselves to the new students. 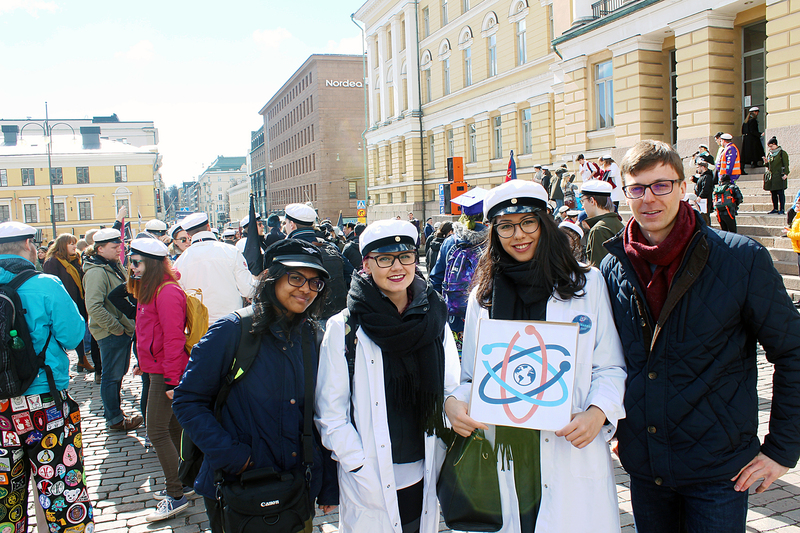 It was the first time that our iGEM association (Aalto-Helsinki Synthetic Biology ry) has participated the event. We got a chance to discuss with many interested students, who were eager to apply for the next year’s team! Even students from the Aalto Business School expressed interest in the project - a good chance to make our team even more multidisciplinary! Finnish Bioindustries (FIB) organized several events as part of EuropaBio’s European Biotech Week 25.9.-1.10.2017. We attended meetings, advertised the events on social media especially for bio students, shared Biotech Week balloons in Heureka and made a video (down below) about synthetic biology with Finnish narration, English subtitles and accompanying assignments. The video was released in our and FIB’s social media and in addition it was put to team Tübingen’s Youtube channel. You may find a version with English subtitles from here. After releasing both the video and the assignments were also added to Opetin, which is a free Finnish material bank for teachers. You can find it from here. As a part of the week a Biotech Week magazine will be printed and 10,000 copies mentioning our input will be spread around Europe. One of the main events of the week was BioFinland Pitching Competition. We applied and got to the finals, which meant free pitching training for the team by Helsinki Think Company and a chance to win 1,000 euros and get our picture to the Nasdaq MarketSite in New York City’s Time Square! Unfortunately we weren’t the lucky winners this time, but the event was a great practice for Boston and we met a lot of like-minded people from our own field. 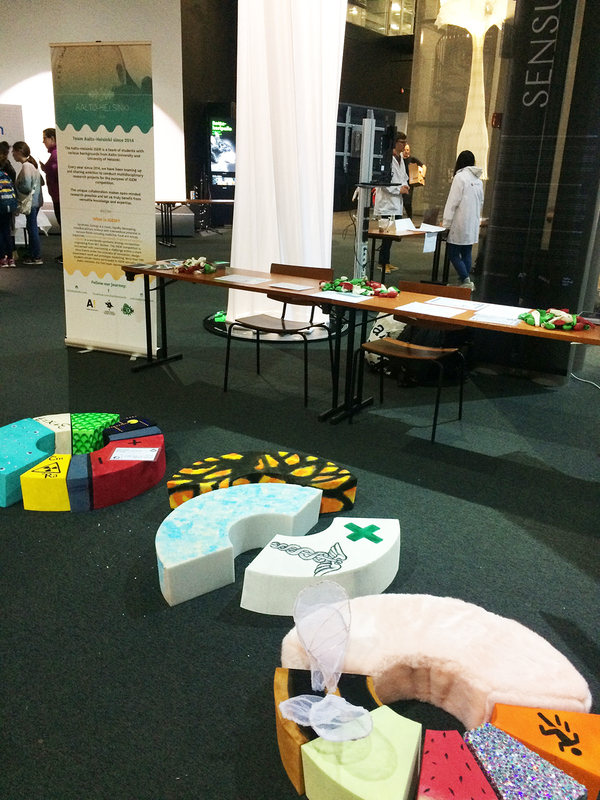 We attended the World Biotech Tour festival in collaboration with the Finnish Science Centre Heureka. For two days in September we had educational activities for school students and families in Heureka. Our aim was to explain and teach about lab work and synthetic biology in an easy and funny way to get the new generation of possible future researchers and scientists interested in biology and chemistry. 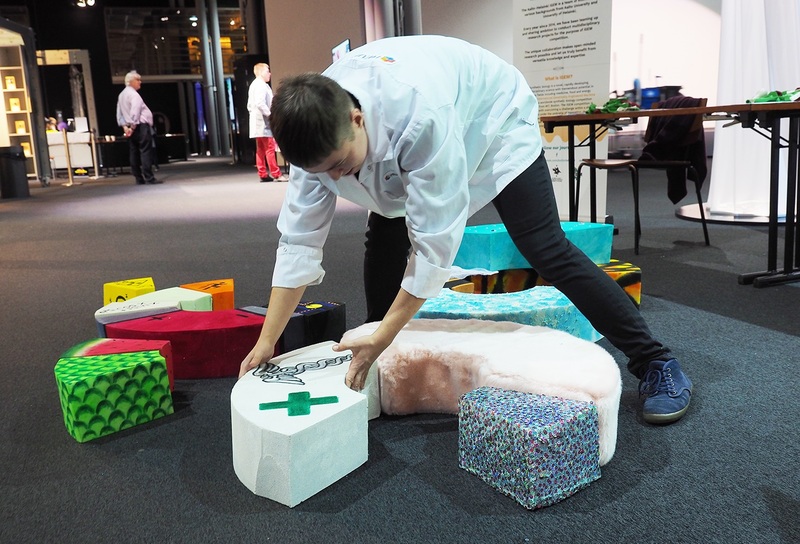 These events - Meet a Scientist Day and Family Festival Day were mentioned in the event calendars of both the Finnish Bioindustries and the European Biotech week. For explaining synthetic biology we created an experimental Plasmid Puzzle which was targeted mainly for smaller children to challenge their imagination and to possibly give them a tiny hint about what synthetic biology and DNA modification could mean. The puzzle was made out of colorful foam blocks that we made by ourselves. 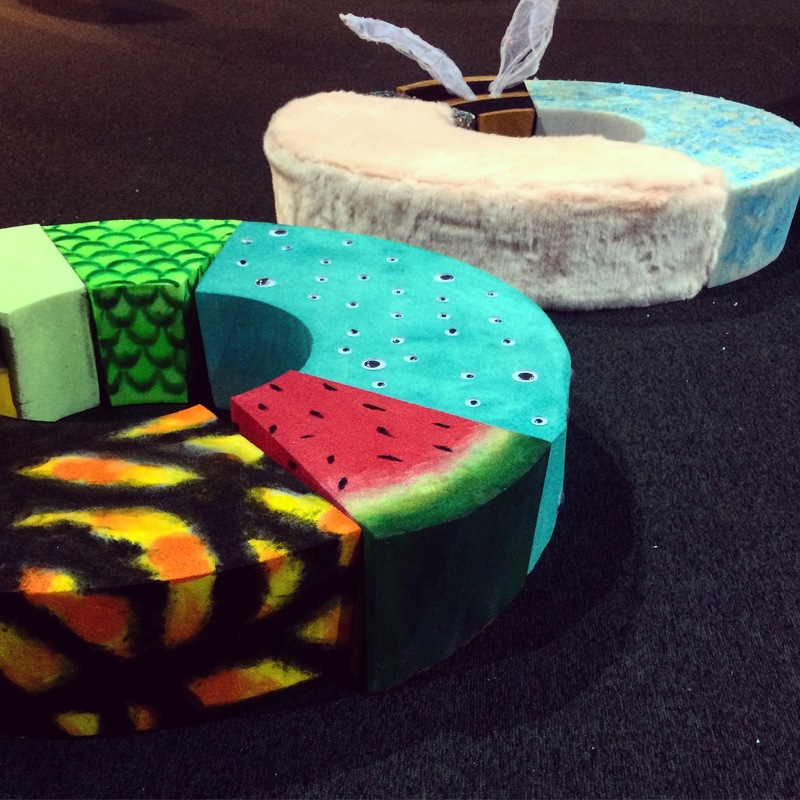 Every block presented a feature, like hot, cold, tasty, fluffy, sparkling, glowing in the dark, radioactive (or resistant to that), fledged and so on. Five blocks together created a shape of a plasmid. We wanted to make an attractive and really visual game for children to get their attention and we definitely succeeded in that. Kids of age 1 to 12 were interested in playing with the blocks and meanwhile we were able to explain principles of synthetic biology to them and to their parents. We got really nice feedback about the activity from the Heureka staff. 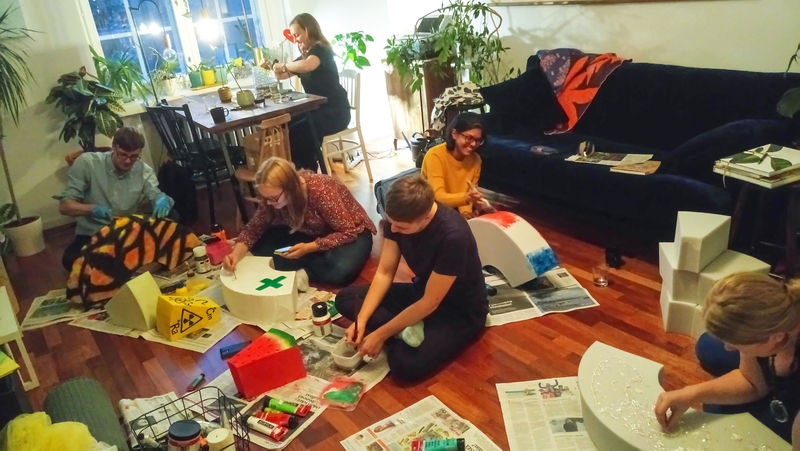 They said that this kind of activity is exactly what they are looking for and what they need in Heureka and they were willing to borrow the idea for future projects as well. In the end we also got the opportunity to be part of something very nice and valuable. After the World Biotech Tour weekend our plasmid blocks were donated to a voluntary workshop meant for tortured refugee families coming from really hard conditions and especially for the children of the families. 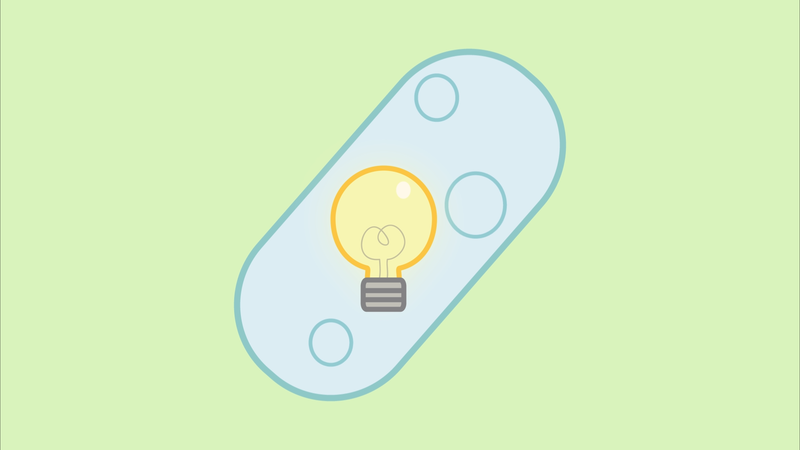 We were happy to be able to give our plasmids another life and purpose after Heureka. For introducing real lab work and methods scientists use in their daily work we had an activity called Protein Hunt. 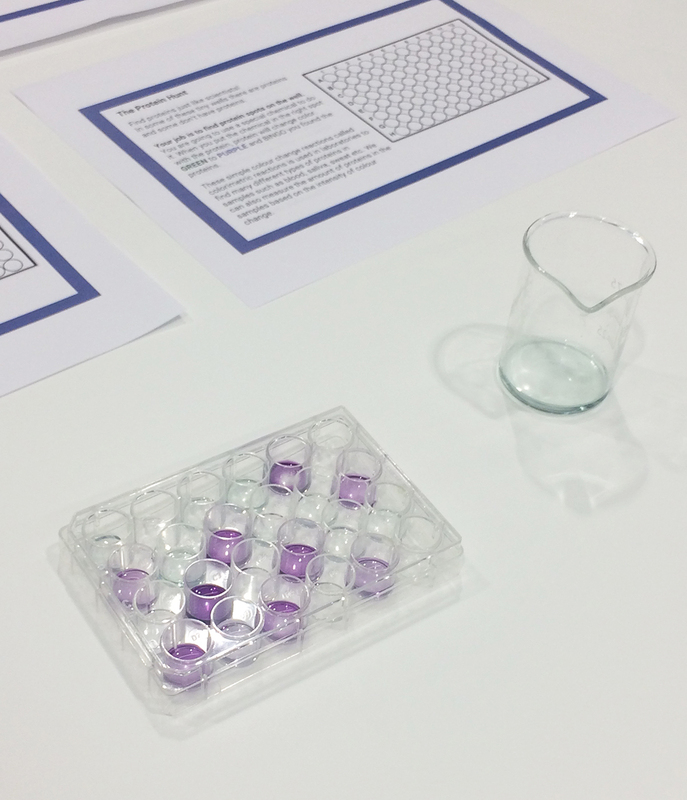 It was a game based on simple color change reactions called colorimetric reactions, which are used in laboratories to find many different types of proteins in samples such as blood, saliva, sweat etc. We had 96-well plates with some of the wells containing protein and some without protein. Every player had a chance to learn how to use an automatic pipette and to try to find hidden proteins from the wells. 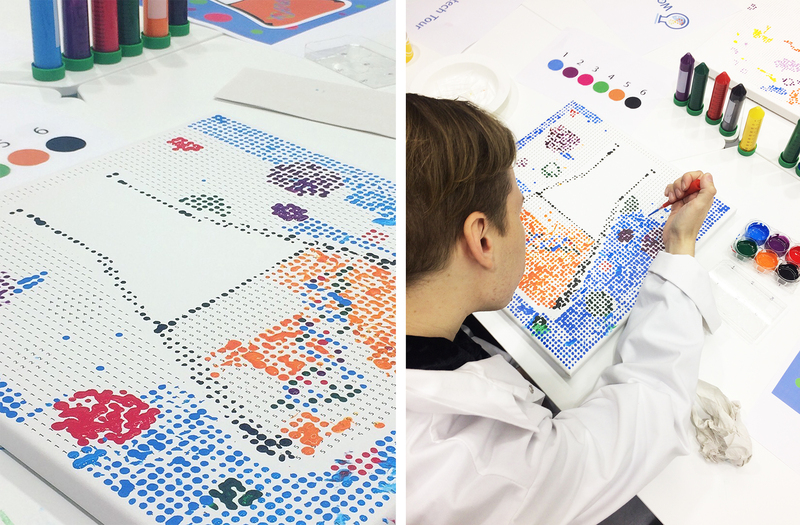 We also helped Heureka to set up Pipette by Numbers activity where visitors were again able to use a pipette and create together a piece of art. We created one platform for this activity and we also took care of another one that came from the World Biotech Tour. It was fun to watch how patiently and neatly some of the visitors were coloring the pictures. Some of our team members were also enjoying this relaxing activity which was really close to mindfulness practices, if you had a stable hand! We attended a peaceful march - March For Science, in order to make a point that in this, cynically named, "post-factual" era, science is not highly valued. It is important to tell people that science is the way of acquiring knowledge - even if it is based on probabilities. The trending other opinion, trusting individual experiences, is far more likely to be dangerous for both the individual and our environment. Science is incredibly difficult to grasp, if you are not a scientist, and that is exactly where Public Outreach comes in. Let us help people understand science!